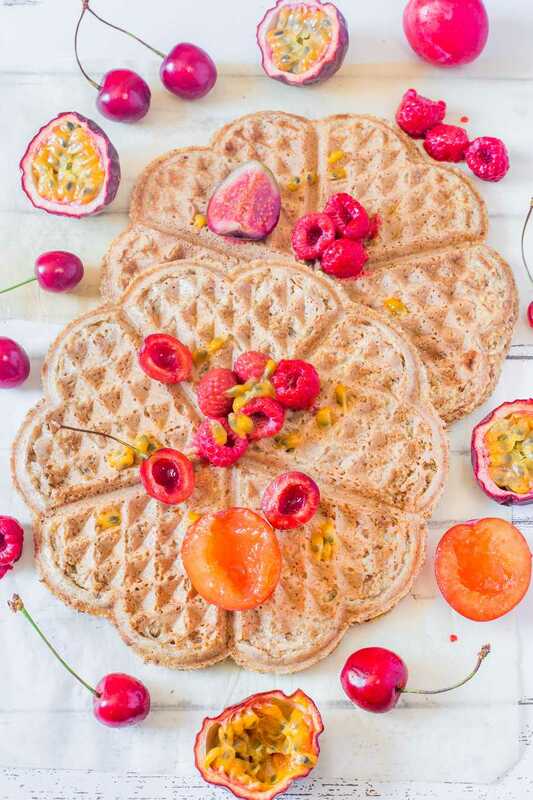 Vegan Breakfast Waffles (V, GF): a very easy 4-ingredient recipe for delicious, slightly crispy but soft waffles that are great for breakfast or as a post-workout snack. Enjoy with fruit, chocolate spread or nut butter. Vegan, Gluten-Free, Oil-Free, Refined Sugar-Free. You may already know by now that oats are my all-time favorite ingredients and that I would use them in every single recipe if I could. 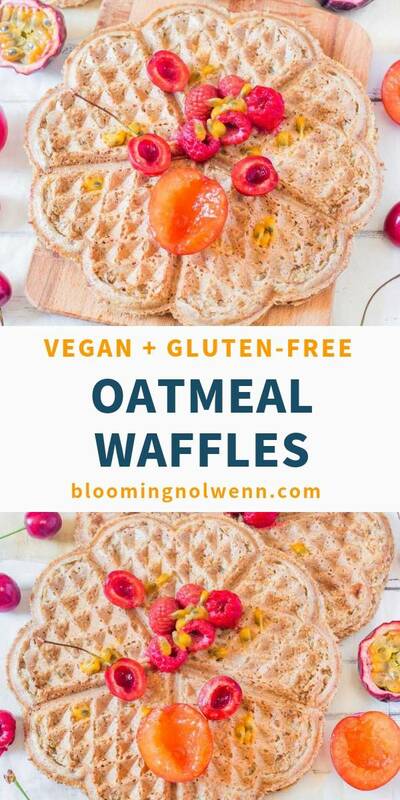 Therefore, I had to share this delicious vegan and gluten-free waffle recipe with you because I have made it quite often the past few years. 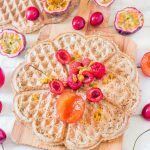 This recipe is adapted from my Easy Vegan Pancakes, which I recommend you to try if you don’t have a waffle iron. Both recipes are super quick and easy to make and require less than 5 ingredients, which I love! 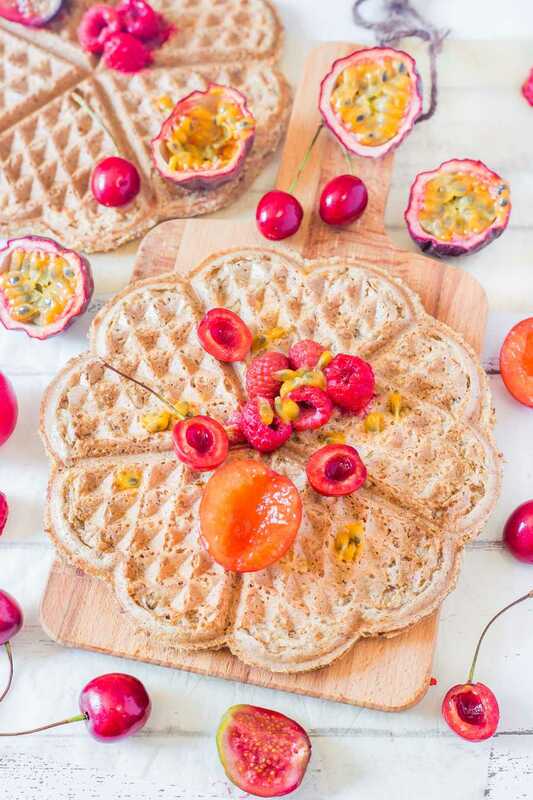 What I love about these waffles is that they won’t make you feel heavy and lethargic afterwards, contrary to the more “traditional” waffles that are packed with oil and sugar. 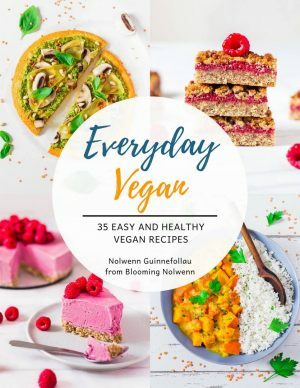 As they are made with gluten-free oat flour – which you can make yourself by grinding oats in a high-speed blender – which is rich in fiber, vitamins and minerals, they will keep you fuller longer and will help boost your energy levels. I personally love eating them for breakfast as they keep me going for the day! 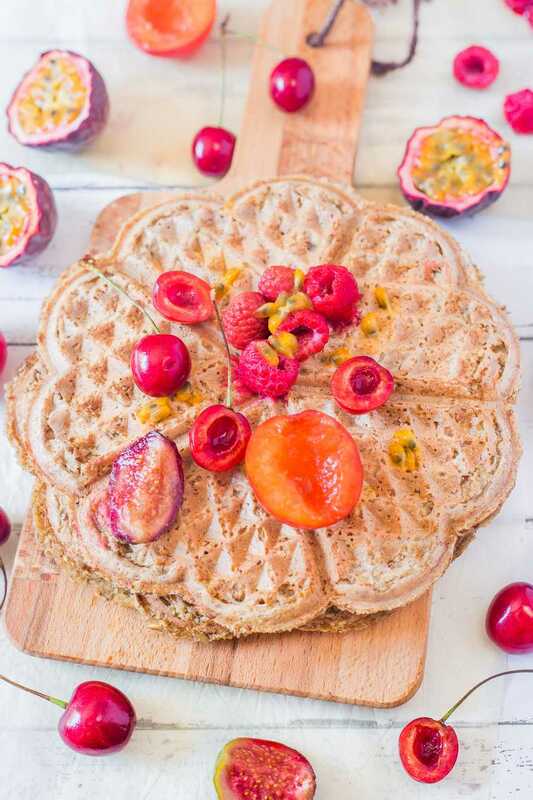 Delicious Vegan Breakfast Waffles made under 15 minutes with only 4 ingredients. They are gluten-free, oil-free, refined sugar-free and very good for you. Enjoy for breakfast, dessert or as a post-workout meal with plant-based milk and vegan chocolate spread or nut butter! To a mixing bowl, add the oat flour, flax egg, mashed banana and water. Stir well to combine. Let set for 5 minutes while your waffle iron preheats. This will allow the batter to thicken a little, resulting in fluffier waffles. The batter should be quite thick (see video) but feel free to add a splash of water if it seems too thick. Once your waffle iron is ready, pour on about 3/4 cup of batter and spread it evenly with a spatula. Cook and serve immediately with your favourite toppings. (I love topping them with fresh fruit or vegan chocolate spread!). This recipe sounds delicious and the photos are amazing. Can’t wait to try this for my gluten free daughter. Thanks for sharing. This looks awesome! I will give this a try. 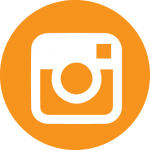 Thank you so much, I hope you will like my recipe 😀 Let me know how it went! 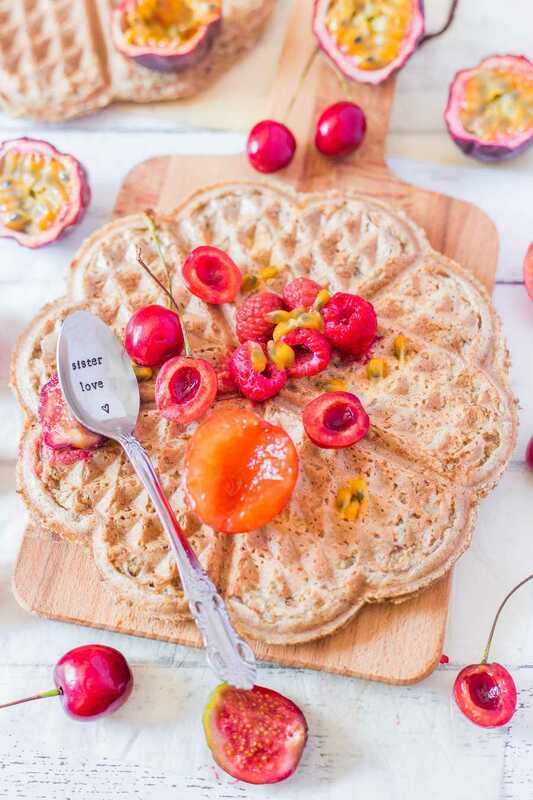 Alongside that, I haven’t tried this recipe as I don’t usually make waffles but with so few ingredients it looks so simple that I feel tempted to recommend it even if I haven’t tried it! These waffles are very easy to make indeed, I hope you will try my recipe one day!